Silchar’s biggest mall, named as Goldighi Mall, built by Silchar Municipality Board, witnessed a new set of visitors on Wednesday. Visitors not to buy, eat or loiter around this magnificent edifice, but to protest on its doorsteps, and that too on a day when the whole of India is busy hoisting the tricolour to commemorate its 72nd Independence Day. 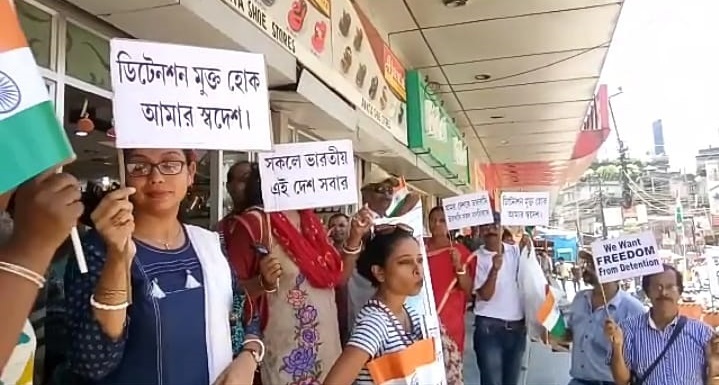 The group of protestors under the banner of Unconditional Citizenship Demand Forum (UCDF) thronged this mall with national flag on one hand and on the other a placard demanding removal of detention camps in Assam. They also demanded the government to stop unnecessary harassment of people living in these parts who have been a victim of partition long time back. The cynosure of all eyes among these protestors though was Niyati Roy, daughter of 102-year old Chandradhar Das, who herself, is battling for the past six months to free her father from the Foreigners Tribunal’s clutches. “Today, Narendra Modi gave his speech standing from Red Fort as the Prime Minister of India, but in 2014 on his visit to Silchar, just before the elections, from a political platform he reiterated that he would quash all detention camps in Assam, but till this date nothing has happened and four years have gone by,” he added. UCDF is also supporting vehemently for the passing of Citizens (Amendment) Bill, 2016, for which, they would not sit back and fight in unison of being members of Unconditional Citizenship Demand Forum.